Part 3 of Windows XP Mode in Windows 7 and Virtual PC, describes three scenarios on how to use Windows XP Mode in Windows 7. We explore how to use a virtual machine application in Windows 7, how to USB device in a virtual machine and how to print from a virtual machine. If you are running certain versions of Windows XP or Windows Vista on a virtual machine, You can access an application directly from the desktop of the host OS when the application is installed in the virtual machine. In other words, you can run Windows 7 on the host and still use legacy applications without encountering any compatibility problems. Windows Virtual PC does not support applications that require bidirectional sound or 3D graphics; games are not appropriate for this scenario. You can only publish virtual applications if the guest operating system is Windows XP Service Pack 3 Professional, Windows Vista Enterprise, Windows Vista Ultimate, Windows 7 Enterprise and Windows 7 Ultimate. Open the virtual machine, if it is not already running. From the Virtual Machine folder, right-click the name of the virtual machine and click Open. Install the application. For example, to install the application from a CD or DVD drive, insert the media in the drive. If the Autorun window appears in the host operating system, close the window. In the guest operating system, navigate to the DVD drive and start the setup. After the installation completes, log off from the guest operating system and close the virtual machine. Open the application from the host operating system. 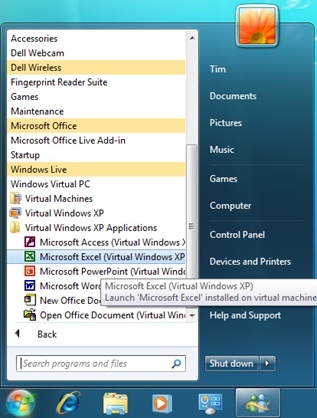 From the Windows 7 Start menu, click All Programs, click Windows Virtual PC, and then click the name of the application, below the name of the virtual machine. After a few seconds, the application opens. If you minimize the application, it appears on the task bar of the host operating system as a minimized virtual machine. You can use the application just as if it were installed directly on the host operating system. Attach the device to the physical computer and turn on the device. From the virtual machine window, click USB and then click Attach [device name]. Windows looks for and tries to install the device driver in the guest operating system. You can also do this yourself, just as you would on a physical computer. After the driver is installed, you can use the USB device from within the virtual machine the same way as you would on a physical computer. To make the USB device available on the host operating system, release it from the virtual machine. From the virtual machine window, click USB and then click Release [device name]. There are a few methods we can use to make a printer available to a virtual machine. Use this method if the printer driver is available for both the hosting Windows 7 and the guest OS. Make sure the printer is turned on and that the printer driver is available for installation. Redirect the printer to the virtual machine. From the virtual machine window, click USB and then click Attach [device name]. Install the printer driver in the guest operating system. Release the printer from the virtual machine. From the virtual machine window, click USB and then click Release [device name]. Restart the virtual machine. From the virtual machine window, click Action and then click Restart. The printer will now be available in the host Windows 7 operating system and the guest operating system. Navigate to the virtual machine desktop, and log on if necessary. Open Control Panel, and then open Printers. Click Add Printer. The Add Printer Wizard opens. On the Local or Network Printer page, select the network printer option and complete the wizard. If your guest operating system is Windows XP, you must manually install the printer driver for each printer. Click Start, and then click Printers and Faxes. Under Printer Tasks, click Add a printer. The Add Printer Wizard opens. On the Local or Network Printer page, select Local printer attached to this computer and clear Automatically detect and install my Plug and Play printer. On the Select a Printer Port page, click the drop-down control and select one of the TS number ports and click Next. On the Install Printer Software page, select Windows Update or Have Disk and complete the wizard. Navigate to the virtual machine desktop, and log on if required. From the desktop of the virtual machine, right-click a file and click Print. Open any application that includes a print option, and then use the print command. All printers available to the virtual machine are listed. Select a printer, and then click OK. In this series of three articles we have explained how to install, configure and use the new Windows Virtual PC and Windows XP Mode for sharing and running legacy applications within Windows 7.